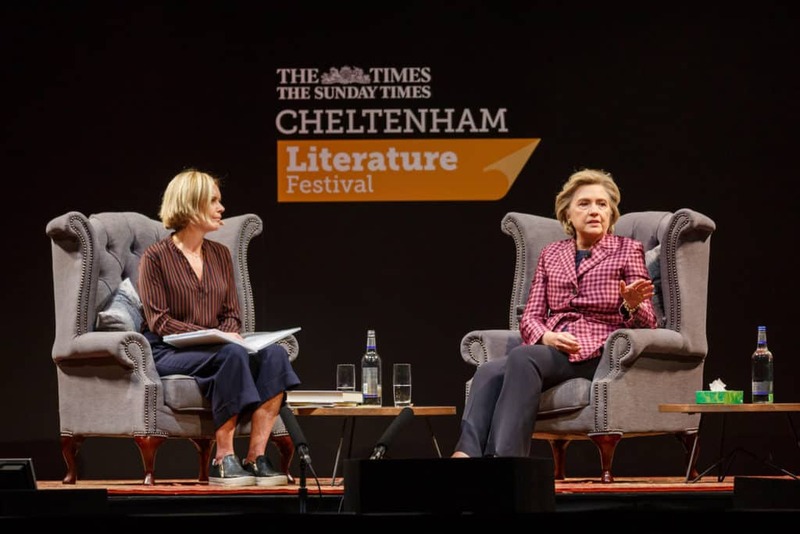 Yesterday the Tarren Team were at The Centaur at Cheltenham Racecourse to deliver full production for Hillary Clinton’s Book Talk at the Times Cheltenham Literature Festival. This 2,200-sell-out event saw Sectary Clinton take part in a no holds barred discussion with event chair Mariella Frostrup. No subject was off limits as the pair discussed everything from Trump & the Russians to Feminism & Mary Berry. Due to the high-profile nature of this event, very detailed planning was required from start to finish and included close liaison with the United States Secret Service and Gloucestershire Police. Part of our role was to ensure that each security organisation was satisfied that we could provide a safe environment for both our guest speaker and those attending. We also worked closely with the press and media teams at Cheltenham Festivals, to provide coverage for the event. This included the implementation of a live stream, which was broadcast on the Cheltenham Festivals Facebook & YouTube pages and The Times website and allowed thousands more people to enjoy the event from home. Photo Credit: Spencer Mcpherson – Still Moving Media.